If you’re looking for a portable Bluetooth speaker for yourself or to give as a gift this holiday season, today is your lucky day. 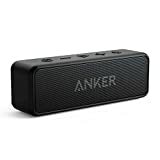 The Anker Soundcore 2 Portable Bluetooth Speaker has killer sound quality and great bass for such a compact device, but the most impressive part is the battery life. You’ll get a whopping 24 hours of play time from a single charge! It’s a great value at $40, but you can snag one on sale today for just $29.99.